i came here to post when i saw my last post and realized i left off my happy birthday to chrissy yesterday! i don't know how that happened!? i even thought of what i was going to type to you and i just saw that it's not there. so i'll have to make up for it, and there's pretty much nothing more than ginnie's little gif she posted to you, so i'll just say, go take a peek again. anyway, happy birthday yesterday and i hope it was so much fun! it's the beginning of the rest of your life!! i loved my 20s and i hope you do too. ok, i'm going to read everyone's posts and then i'll come back! I thought this picture was kind of neat. 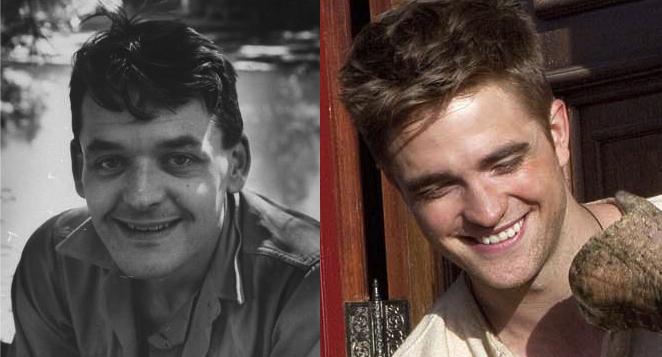 It's a side-by-side shot of a young Hal Holbrook (the actor who plays older Jacob Jankowski in WFE) and of course, our dear Robkowski. I found this on waterforelephantsfilm.com website. If you haven't seen it, it's a wonderful website dedicated primarily to the movie adaptation of Water for Elephants, and the many aspects of filming, with a heavy dose of all things Rob. Jade~ Hi! Hope you're well; thanks for checking in with us! Caryn~ Hope your training day goes smoothly tomorrow, and I'm sure you'll be the hostess with the mostess. At least you'll be able to properly rest your voice tomorrow. Do you have to travel, or is this training local? Happy Birthday to your sweet Littlun! Hope his day was a blast. I'll be cheering for Butler Thursday; I think they play right before Vandy does. At least I'm off work Thursday-- but I'll be driving my son to a birthday party and my daughter to her basketball practice just as the Vandy game is ending. I loved reading the WFE production notes last night, and they just made me more excited about this movie, as if that's humanly possible. The only bit of news that might be considered slightly spoilerish was that the character of movie August is a combination of book August and Uncle Al. I don't mind knowing this information ahead of time, as it will keep me from distracting myself during my first viewing as I randomly wonder, "Where is Uncle Al?" I think this form of creative license will actually streamline the movie somewhat, and make it easier to effectively condense the story into a two hour movie. Christina~ I think you'll enjoy reading the WFE production notes, and I didn't read anything I'd consider very spoilerish either. Sandy~ Your St. Patrick's Day party sounds like fun, and I'm sure it was a great success. Thanks for cheering for Vandy in the tourney! You might as well cheer for Belmont too, if you don't mind. My daughter seems to be enjoying her basketball practices so far. The coach is really focusing on fundamentals right now, which is a good thing. Her first tournament will be the weekend of March 26th, so we'll see how that goes. I just knew you were about to post the picture of "Caryn's corner".....good times, good times. I think I'll save my Vanity Fair to read in the car when we head out of town this weekend. Susie~ Hope your meeting went well tonight. Thanks so much for pm'ing the link to the Les Mis pictures. I'll check them out tomorrow night when I have more time. I'm frightened for the people of Japan too, and I wonder if the government and the authorities are really telling the public the truth, or just telling them as little as possible to try and prevent mass panic and hysteria. I'm with you....I'd rather not see Rob's full monty either. Rob's full booty? That's another thing altogether. Trine~ It's so great to hear from you again. Hope the physical therapy is helping your knee recover from surgery. Loved the "lobster" pic of Rob, and remember that as one of the photoshoots that just kept on giving. I think you would love Water for Elephants, if you have a chance to read it. Marielle and Ginny~ Loved all your funny comments about Rob and "Playgirl" this afternoon--they made my day. Jenn Jenn~ Hope you're well, and we'll catch you on the flip side. It so nice waking up when it’s starting to get light already.. I have a feeling my mood is completely linked to the sun…the sun is up already so I’m quite cheerful only very sleepy, it got late last night. I’ll reply later today…I’m sure there is soccer on tv which gives me free laptop time…. Susie, I’m not sure how much of the story about the moon causing the big quake is real or fiction, I know it’s been researched and that it has some influence but that much I’m not sure. caryn—i just finished reading your suggested production notes on WfE and loved it! thank you for sharing! i forwarded it to my friend who i am trying to convince to read the book. she said she wasn’t going to because it was about an affair and she just doesn’t like that stuff. well i feel the same way, but luckily this is not a normal affair. i love that jacob is a morally driven person. i do actually wish they had waited until she was out of that relationship (sorry that’s just who i am and how i am hardwired), but i really do see the whole relationship as marlena and jacob were meant to be together and august didn’t deserve her and she needed out and... basically what reese said, “it’s about second chances.” anyway, we’ll see if i convinced my friend to read it. happy birthday littlun!! that is so cute that he wanted a kiss on his birthdate time. by the way, i love jazz too! it was my first musical love—well maybe it was tied for classical. i took a ‘history of jazz’ class in college and it was dreamy. i got hear so many original songs from the 20s, 30s, and 40s. aw, i still think it’s the best music out there. hubs made a cd (it really it quite a random mix) for our honeymoon and on it was billie holiday’s ‘pennies from heaven’. i still grin a silly grin when i hear it. sorry this is so long but you just kept adding new things and although that playgirl article was basically the same stuff i’ve heard years ago, i still loved it! i always love hearing his sense of humor! btw, a dolphin!? now i want to hear! haha, that’s great. tracy—the funny thing about this zumba class is the more i go, the bigger the workout i get! i was so confused by that, but my friend and i decided it’s because we’re actually getting some of the steps now so we’re technically working harder. the good thing is i look up at the clock and go, “wow, it’s already been an hour? !” so it is a good workout but doesn’t feel like one. wow, thanks for that comparison! if you cover the eyes, they have very similar cheeks and nose and chin. interesting! dawn—i’m so sorry about your mom’s feelings toward your twilight admiration. that’s sad. i hope you guys come to an understanding about it. good luck on the 17th! i can’t wait to hear about it! good to know about your zumba experience and it helping with your coordination. i definitely feel something—more comfortable, more agile, more...loose. i love it. caryn, ginnie, marielle, tracy... monty, monty, monty! hahaaaa!! i am with ginnie though. really truly, prude might as well be my middle name. –well on second thought unless i’m with my hubs. i’ve learned to live a little and let loose more and more. i’m liking that style better than i thought i would. dovrebanen—i’m glad you’re looking into all sorts of things, and i’m glad you don’t think it’s anxiety. i hope you figure it out soon. my friend had a terrible time eating for several years and finally she got some real results from some labs that showed she has an allergy to wheat. so now she’s eating gluten free and is so happy to be enjoying food again. it’s a good happy ending story! susie—yes you should at least get some water! maybe even a little food that stores well and can be kept for a ‘just in case we’re stuck in our house and stores aren’t available for a while’ kind of thing. our church got us doing it. we have a 6-month supply of freeze-dried food. who will be the favorite neighbor if something should happen? meeeee! just kidding. anyway, i agree, i’ll not share my twilight stuff if he’s going to cheapen it! but seriously i agree and part of the reason i fell so in love with twilight was that it reminded me of all the good parts of our marriage. hubs does have a pure love for me that i treasure and reading it (especially together!) really helped me, and us, focus back on that because we saw it on display in the characters of bella and edward. i think sometimes couples just get so into life and the work of it that they forget the gem next to them and slowly the sparkle fades. it’s something we proactively work at (date nights and love notes and going out of our way to show love, etc). anyway, i can’t wait for you to meet him (and me, hello!)! marielle—i love that when you’re saying “good morning,” i’m finally saying, “i should get to bed.” are you translating or what? your last comment got me curious. awww, my pillow is calling to me. good night! Proud resident of Rob's Halfway House !! Location: Rob's HalfwayHouse, shacked up with some FicWard. Hey girls! Phone posting as I'm sitting and listening to my colleague do her stuff. It's a good thing that I'm not training today. My voice is even worse. I tried to do the introduction at least, but could barely even do that. But, on a happier note; I was bummed because I forgot to bring the netbook. But, I had to run to Kroger and get batteries for the remote and, as I'm walking in, right there is the movie-tiein of WfE. Anyone want to guess what else I bought at that Kroger for my consumption today? I'm so bad somedays! Well, on to posts as I posted my HumpDay submissions late last night. Tracy~Yes, I had to travel about 2 hours, which wasn't bad. Although, there isn't a Starbucks the last hour and a half. I can't help it. I'm not a fan of McD's coffee, so that was a bit rough. I saw the side-by-side with Hal and Rob and I was surprised. While Hal is an attractive guy, Rob, of course is just other-wordly. But, there is a definite resemblance. Yes, I think the character combination is a good thing and I think Christoph Waltz will be amazing as August. Rob's full booty!! BWAHAHAHA!! Love it. If I were on an actual computer, I'd post THE EPIC HINEY SHOT from Montepulciano where by we almost get it. Marielle~ you're absolutely right! 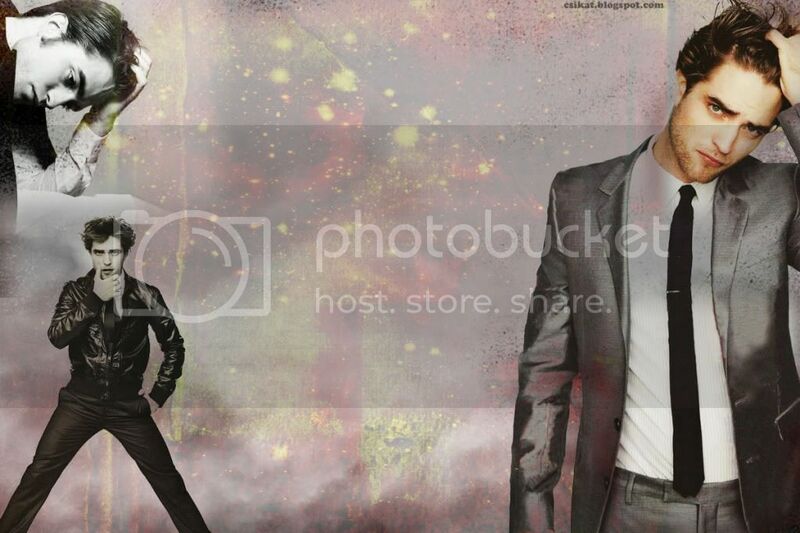 It would HAVE to be an all male set if Rob were ever to do that photoshoot. The womwn would never be able to function. We'd just keep staring, drooling and babbling incoherently. Lulu~ That's interesting that your friend has that strong a stance. I'm in complete agreement as far as the morality of an affair and that it's absolutely more appropriate to end the previous relationship first. But, I also have a unique view of abusive relaionships and how the rules can be skewed in those cases. Kudos to her for being so strong in her morals. But, I can't say I'd let it keep me from reading a book. Certainly, I'm a believer in the idea that expanding our experiences through whatever way you can. Sandy~ thanks for getting in the important stuff! *hugs*. Hi everyone, I have been a busy little bee, but I see that I don't have too much to catch up on. I hope everyone had a wonderful weekend. I am planning a surprise party for my husband's 40th so I am hoping that it stays a surprise and it turns out ok.
Marielle, I love you pic. It does bring back memories. The song he walked to during that scene by Steve in Hurricane Bells I saw in NY. My friends brother in law is their tour manager and I ended up driving the tour van to the tour manager's house. I only drove in NY like 3 times and I drove their van with a thing on the back with all their instraments. So thank you. I love that pic. because it always reminds me of what a great time i have had with twilight. Crissy, I don't think I know you, but I saw someone said happy birthday so I wanted to say hi and Happy Birthday. Have a great day eveyone. Shauni - Hey there girl! I'm glad you are enjoying your new courses at uni. How long will your course be? My bf done his degree in law (but he decided not to actually be a lawyer LOL). Glad you enjoyed London!! At the UKTwiCon, Jodelle Ferland said that she had auditioned for the HG movie, but wouldn't really saw more about it. I've not read the books, so can't say if she would fit the part, but she seems pretty cool! Susie - I have heard a lot of things about Gorilla's in the Mist but have never saw it...what is it actually about? Haha, yep we call food shopping messages..I don't know why, it just has always been called that LOL. When we go "shopping" it tends to be to the proper shops, eg. clothes, books etc. Glad you liked the ActionRob pics! Our kitchen is actually a little bit different now, as we got all the things finished that weren't quite done when you came to visit. I was looking at the photos and laughed, as it looks like I'm advertising tons of food products Haha! That's why I'm really confused about the sleep thing as I'm not stressed at all LOL. It's really annoying... I used to sleep thorugh anything, and now the slightest thing wakes me up. I'm hoping it passes soon!! Thank you for the LesMis photos! The show looks so professional!! It's hard to beleive it's just high school kids! When about are you due to get ActionRob? Ginnie - ActionRob says hi, and I'm sure that he missed you too!! Tracy - I'm sure ActionRob would be helpful in doing the laundry too - he seems to be open to most ideas LOL. I think this weekend he is going to help me cook (my parents are coming over for tea). Nope I haven't started looking for my dress yet, but I have been looking at bridesmaid dresses. I'm not really sure what I would like, as I like a few different styles. I need to book some appointments at dress stores so I can start trying stuff on! Jade - Hey there How have you been? Marielle - Haha, yeah I think my bf thinks I'm a wee bit weird, but at the same time, I think he thinks the ActionRobAdventures idea was pretty cool! Dawn - Sorry your mom has a negative opinion of Twilight. Does that mean you can't go and see 100 Monkeys now? Caryn - Happy birthday to Littlun! Btw, I had a wee giggle at the PlaygirlUK & full monty conversations you were having! LOL! I hope your voice feels better soon! Trine - I'm so happy you posted again!! Sorry you don't get to do much just now with your knee. How long will it take to heal? Banner by the super talented TammyAZ! Yikes! I'm supposed to be somewhere now!!! A quick HAPPY HUMP DAY!! JennJenn – I agree. There should be a emoticon for Fly-by posting! MODS? Sandy – I just about died when I opened your first pic from last night – I haven’t been keeping up with the new WfE stills! Wowza! You’re a fun Irish party gal, aren’t you? I’d love to come to that party – but I want some Cabbage to go with my corned beef! Love Caryn’s meditation corner – room for more? Was that from last year’s e-pary? Hey – you’ve already seen PFach! (but not up close) Am I a crazy friend? HAHAHAHA! OK – now I’ve seen your Hump Day pics – STELLAR!!! Caryn – OK – That early Hump Day gif definitely made me all woozy and I thought I was going to faint! Dolphin? I suppose that could be possible since you usually sound like a hyena, right? (What ever happened to those first attempts at getting a photo of the two of us?) Our work cafeteria (the school district’s admin offices are in the same building as our adult ed program) is having a March Madness brackets “contest”, so of course I’m participating. I thought of getting tips from you, but hey- I’m independent, right? I used a combination of bias towards any Halfway House sister’s state and seed number. Bias comes first, so of course I have Butler winning the whole shebang!! And of course, Vandy (for Tracy) against Butler in the final four. (Sorry, Tracy, but Caryn is just more vocal than you are – there’s not two ways about it - so I’ve got to pick Butler to win.) Leading up to that for the SOUTHEAST – 3rd round: Butler vs Pitts, Sweet 16: Butler vs Wisconsin, (I picked Wisc to go that far because that whole state is mad as heck so they’ll play well.) Elite Eight: Butler vs. UCLA, then the final four which I already mentioned. Now don’t tell me I’m completely crazy about any of those pics – you never know! Tell us more about the movie tie-in you bought. Sorry you really have lost your voice. It is darned hard for an extrovert to not be able to talk! Tracy – Nice WfE fansite. I do see the Holbrook/Rob resemblance, but we know who is cuter….You are again, soooo funny! Full Booty! I can just hear you utter that with your velvet voice! Will we see it in BD#1? Marielle – What a great Halfway House dream! I must have been the one you were all posting to, right??? If you ever want to move to that big island, you’ll have to come to terms with the fact that the weather isn’t any better there!! Are you translating for your job? Lulu – I really do love how you are opposed to affairs, but willing to accept being rescued from an abusive relationship as Marlena is in WfE. I’m an ultra honest person, and of course infidelity is extremely dishonest, so I don’t respect those who do it. I think in the storyline – the reader wants some action between the two when the emotion is so intense – August losing control and then Jacob standing up for her. Dawn – What are you planning for your hubs’ surprise party? My hubs gave me a surprise party for my 30th and I really was surprised – so much so that it was hard to have a good time! It was a weeknight and I wasn’t reved up for a big party. For my 40th party, I sang jazz. I had a jazz combo at my house (piano, drums, bass, and guitar) Everyone loved it, but I could hardly enjoy myself because I was so worried about performing!! So for my 50th I had an “open mike” theme – I have many friends who are musicians on the side. I still sang, but only one number. Everyone had a lot of fun. Jaclyn – I gasped out loud when I viewed your hump day pic!! Thanks for appreciating the Les Mis pics! The level of production is probably similar in most big public high schools in the U.S., but this one had so many especially talented singers/actors it was mind blowing. The sleep thing – you could be subconsciously worried about having to find a job. Or, just so much on your mind – even good stuff – that your brain is over stimulated. OR, is your bf feeding you some weird chemical in your tea? JADEY!!!!! So glad to see you!!!! So glad all is okay with you! I am off to check some messages on FB and then be ready to hit the hay as soon as Idol is over! Have a great ST. Paddy's day!!! Wear some green!